I’m working every day to cut through gridlock in Washington and deliver real results for Rhode Island. As your representative, I’ll continue to protect Social Security and Medicare, and champion legislation that will bring American manufacturing jobs back home. I’ll keep fighting for federal investments in our infrastructure, which will create good paying jobs that support working families, and stand up to the gun lobby to pass common-sense reforms that keep guns out of the wrong hands. David Cicilline fights every day for Rhode Islanders, from making sure our homes are safe from lead paint to ensuring that the Port of Providence has the best resources available to move goods and services, David never stops working for the Ocean State. David Cicilline helped Andrea, a U.S. Marine Corps veteran, successfully resolve her disability claim within days after her family from Pawtucket contacted the Congressman's office. PROVIDENCE, RI - The Rhode Island State Lodge, Fraternal Order of Police has unanimously voted to endorse David N. Cicilline (RI-01) for re-election this fall. Rhode Island benefits from experienced, hardworking leadership in Washington. 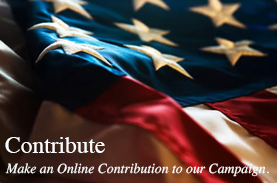 For that reason, we encourage our readers to vote to re-elect U.S. Representatives David Cicilline and James Langevin. As Democrats, they could become more powerful after January, if pollsters’ predictions hold true and control of the U.S. House flips to their party. PROVIDENCE, RI - Congressman David Cicilline (R-01) will welcome Dr. Jill Biden, the Second Lady of the United States and wife of Vice President Joe Biden, as a special guest and honoree at his 4th annual Women's Luncheon on Monday, November 17. 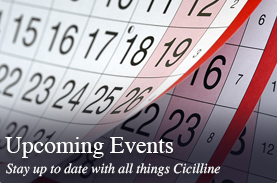 The event serves as an annual celebration of local women, their accomplishments and contributions to Rhode Island, and benefits Congressman Cicilline's reelection campaign. 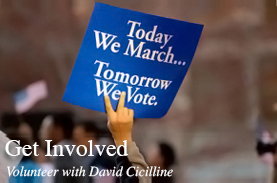 Congressman David Cicilline is a proven fighter who puts the interests of his constituents first and works hard every day to improve the lives of Rhode Island families. He was elected to one of only a few House Democratic leadership positions and serves on the Judiciary and Foreign Affairs Committees. In Congress, he has been aggressively fighting for legislation that would help more Rhode Islanders get ahead. "Thank you Rhode Island for the trust you've placed in me to continue to serve as your advocate in Congress. 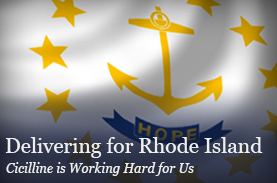 Together we can advance the priorities most important to Rhode Islanders and hard-working Americans. The new Democratic House majority will be fighting to lower the cost of health care, create good-paying jobs, rebuild our roads, bridges, and schools, and end the corrupting influence of money in politics. Thank you for making this possible!"